A: Good questions and they require a complex response. Every situation is different, so here are some broad answers. By filling the “void” I assume you mean how to get work done. Starting and operating a business is the most difficult undertaking of anyone’s career choices. It’s not easy. The void is filled by working long hours with full support – if there’s a family situation – and outsourcing where necessary. That’s also assuming there’s enough cash flow for freelance help and the ability to sustain it – with the preparation of sound financial statements and knowing what drives profits. Unpaid interns can be useful, in general, as long as they’re not used to create business profit and the work experience clearly benefits and complements their education. Expanding entrepreneurs should have an awareness of where the talented employees are. Before hiring, there must be a need but an adequate cash flow. That means a full command of budgeting basics, maximizing prices for goods and services, knowing the break-even point and profit margins to cover all costs associated with employees. The time to resign is when a person has all the underpinnings for success, which includes an action plan. I can’t emphasize cash flow enough – to have adequate income from marketing and customer retention — and minimizing costs. Incidentally, no employer is thrilled to lose a valued employee who’s destined to become a competitor. But whatever the situation, a person can’t be too concerned about resigning. “People-pleasers” don’t make it as entrepreneurs. In any event, I’d give adequate notice and take precautions to keep the relationship on a friendly basis for possible networking in the future. Tips for Moms Who Want to be Entrepreneurs from Home — So, you have a job and would like to fire your boss to work at home. Let me caution you. Starting a business at home might be the biggest challenge of your life. Starting a home-based business has risks. It can sap your energy and time. You Have a Great Business Idea, but You’re Stuck in 1st Gear? — New entrepreneurs often have great ideas but many hit self-created stumbling blocks. Here’s how to avoid the pitfalls. 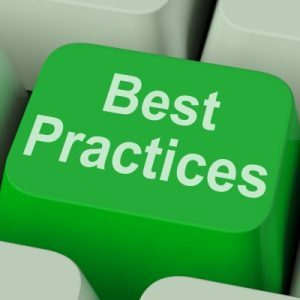 The 8 Best Practices in Small Business Marketing — True, the constant drumbeat of uncertain economic news can be disconcerting. For many small businesspeople, the uncertainty can be so unnerving it leads to fear. But fear can be healthy if used as a motivator to act. Early stage companies might have critical new funding prospects thanks to a program run by the U.S. Small Business Administration (SBA). To create jobs and to help new entrepreneurs get capital, the SBA launched the initiative – via a new Small Business Investment Company (SBIC) capital investment program in May 2012. That’s why the SBA has recruited experienced investment fund managers. If licensed for the program, investment funds can multiply their collective assets for lending up to an aggregate $1 billion to new entrepreneurs. “Early stage small businesses face difficult challenges accessing capital. At the same time, in this financial climate, venture capital funds are finding it difficult to raise money from institutional investors,” said SBA Administrator Karen Mills. “By licensing and providing SBA financial backing to Early Stage Innovation Funds, we hope to expand entrepreneurs’ access to capital and encourage innovation as part of President Obama’s Start-Up America Initiative launched last year,” she explained. Such funds can get matching SBA-backed funds up to $50 million. The proviso for funds – they must target at least half their funds for young businesses. The SBA will earmark the funds for a 60-month period. In announcing the early-stage program, an SBA press release cited the difficulties for young companies that need between $1 million and $4 million. “Since January 2006, less than 10 percent of all U.S. venture capital dollars went to seed funds investing at those levels, and 69 percent of those dollars went to just three states: California, Massachusetts, and New York,” explained the press release. “The Early Stage Innovation Fund initiative will target this gap by licensing and guaranteeing leverage to funds focused on early/seed stage investments,” promised the SBA release. Since 1959, the SBA has worked with SBICs to provide capital. In 2012, there are nearly 300 SBICs with at least $17 billion in capital. Here’s the SBA early stage Web page. For all SBA investment programs, see this page. If you’re unemployed or under-employed, do you have an entrepreneurial spirit? Would you like to be your own boss? Are you gainfully employed but have a great entrepreneurial idea? If answer yes to any of these questions, you might want to launch a new business. A tepid economy is often an excellent time to launch a new idea. Keep in mind there are at least 21 essential marketing points to keep in mind in launching a new enterprise. 1. Determine what you’d love to do and perform a SWOT Analysis – identify your strengths, weaknesses, opportunities and threats. 2. Give sufficient thought to your objective (sort of a brief mission statement). 3. Write a one-page vision plan outlining how you’ll achieve your objective and include your vision for cash flow, multiple revenue streams and marketing. 4. List your products and services. 5. Develop five value propositions — the 5 benefit statements – the benefits you will, not can provide. Otherwise, your prospects won’t believe you’re confident in your products or services. 6. Your branding slogan should be in three to five words – e.g., mine is: Proven Solutions for Maximum Profits (ideally it should be in italics and in much smaller font than your business name). 8. A memorable logo will convey value — why people should buy from you. Make sure it’s simple enough (16 x 16 pixels) for a favicon that will appear in the address bar of the browsers. A favicon shows authority online and will help level the playing field for you. 9. Develop a Web site (the name should connote your benefits but be short as possible) and include your branding slogan adjacent to your business name on the first line. A simple, free WordPress template will suffice for now if you have a limited budget. Consider inserting informative videos about your products, services and industry. And make it easy-to-use for customers using mobile devices. 10. Strategize for a Web description — the value-statement phrase that Internet users see when they see your Web site listing. Make certain it isn’t too long — 15 to 18 words maximum. Otherwise, the browsers will cut off your description in mid sentence. 11. Submit key search words to the search engines – so visitors can find you more easily — a maximum of 10 words so you don’t confuse the browsers’ crawlers. 12. Informative content is king so install a blog on your Web site – to increase your prominence on the Web and to pique interest of Internet users. For maximum credibility and presence on the search engines, each article should contain a minimum of 700 to 800 words with at least one image to illustrate your topic. 13. Your bio – a half-page or quarter-page on your Web site emphasizing your accomplishments (why you’re an expert). 14. Marketing tactics/elements (including paid advertising and use of the news media and strategic press releases to drive business to you; and social media, especially Alignable, Twitter, Facebook and LinkedIn if your target is businesspeople). 15. List and court centers of influence – people and organizations that are capable of referring business to you. 16. Have a one-page handout – a flyer with benefit statements, buyer’s remorse statement, slogan, logo and contact information. 17. Don’t forget your picture on all materials (use the same picture in all your marketing efforts). 18. Work on your marketing each day – even if you’re busy – when business slows down, it’s too difficult to quickly ramp up marketing for positive cash flow. 19. Get an excellent mentor. 20. If you’ve done your homework and bounced your ideas by a great mentor, don’t let any cynics dissuade you from your dreams — don’t engage in self doubt. Admittedly, this isn’t a comprehensive checklist, but these tips will get you started. Each of the above tips is explained in more detail in the more than 200 articles in the Marketing/Sales section of this portal. You’ll find what you need.